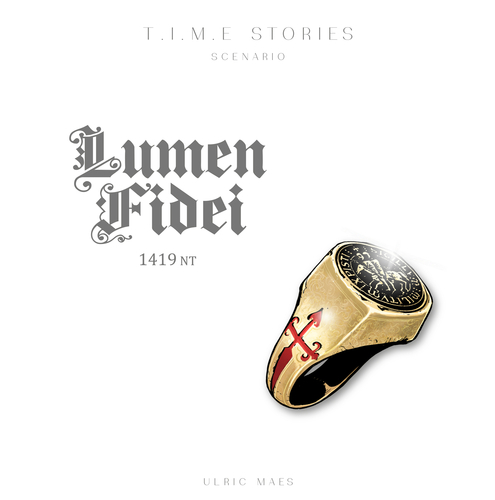 T.I.M.E Stories: Lumen Fidei is the fifth expansion to the T.I.M.E Stories franchise. As you probably know from previous reviews, T.I.M.E Stories is a novel cooperative game where players take on the identities of people in different time streams – trying to rectify problems in the space-time continuum. In this scenario, as you might imagine, the new characteristic concerns your Faith (or impiety). When you examine the receptacles, you will see that they been diametrically divided among the faithful and the impious. The faith or infidelity of your receptacles will position your group on the faith table. In this mission, codenamed Lumen Fidei, you and your teammates are sent back to 15th century Spain, near the end of the centuries-long Reconquista—the wars between Christians and Moors for control of Spain. Your receptacles are part of a delegation, charged to accompany Michel d’Ailly, the Legate of Pope Martin V. You’ll be attending a secret meeting of Christian military orders, but your objective is a strange stone that has captured the interests of Christians and Moors alike. You need to find and retrieve that stone, bringing it safely back to the T.I.M.E Agency before anyone else can secure it! There are some special circumstances surrounding this mission. You already know we’re using a new travel procedure set up by the TTD (Transfer Technical Direction): ten TU for your first run, twenty for your second, and thirty for your third run and following runs. As you might expect, this will dramatically change your progression… and that’s not the only new procedure you’ll need to contend with during the Lumen Fidei mission. With this mission, you’re returning to a time where faith has an unknowable power, and you’ll see the effect of that throughout the mission. The choices that you make will impact your receptacles’ faith—with effects that you’ll track on the faith table. As you can see, rising to the rank of Pious can give your Christian receptacles great power, making them much more adept at completing tasks and passing tests. You can gain similar rewards for leading your receptacles towards apostasy, but you must be cautious. If your group falls to the rank of Infidel or Heretic, there will be impacts on the outcome of your mission that even we cannot predict. T.I.M.E Stories was the first mainstream puzzle game for me, and as such, I still have a huge soft spot for it. The stories and storytelling still are tops for the genre. I think a big reason for this is the format – the game usually has 120 to 180 cards with which to tell the story. This amount of space seems to be the most amongst the puzzle game genre. 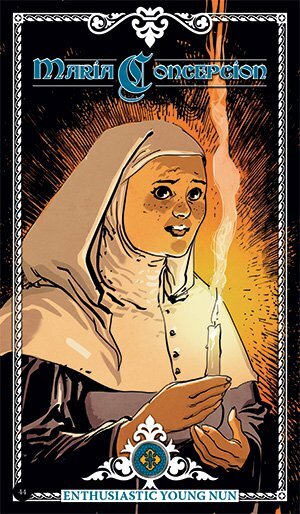 Lumen Fidei has a rich depth to its backstory, and we were firmly engrossed in the story for the duration of the game. While the storytelling seems to be the advantage of the format, a weakness of the format also once again became evident in our play. With the way that the game is set up, there isn’t any method to provide clues if the players get stuck. Many of the other puzzle/escape room games offer hint cards in the box or sometimes a website with helpful clues. T.I.M.E Stories has never had that, and some of their puzzles are quite difficult – more on this later. There are also no way to give clarification on rules as they come up. 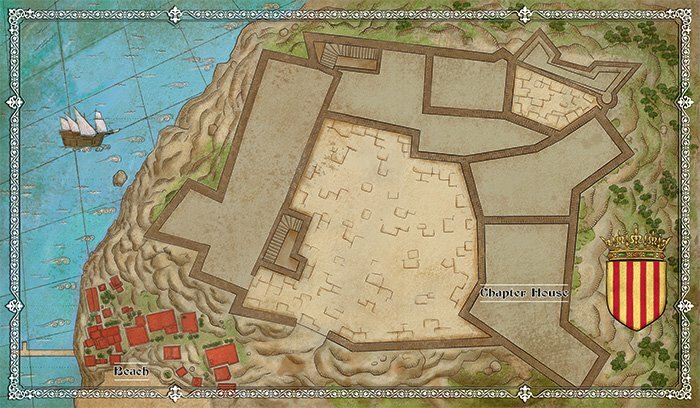 You get the specific rules on the opening setup cards of the scenario, but if you have questions, your group will just have to work them out on their own. For now, back to describing the scenario – without spoiling it. I love the way that this series has managed to keep things fresh by changing some of the rules while keeping the same overall structure. The big advertised change in this game is the increasing time unit limit for succeeding runs. Having the end quickly come up at the start of the game really magnifies the importance of your early decisions – as you don’t have a lot of time to get stuff done before the time runs out. As far as complexity goes, this one seems to be about the most complex. The story seemed to have so many different options, and after a bit of a struggle (well, honestly about an extra 45 minutes), we finished the story. Our group stuck to our guns of not taking notes during the play of the game, relying only upon our memories to solve things, and this was part of our downfall. Let me just say that the puzzles in the T.I.M.E Stories series are becoming increasingly complicated, and some of them may not be possible to be solved without taking notes. 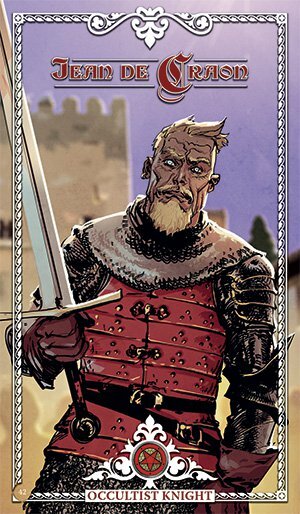 However, the other issue for us was that there appears to be a misprinted card, and in our game, this really stopped us dead in our tracks (for that 45 minute delay). I have since talked with two other groups that have played the scenario, and neither of them encountered the same problem that we did – so it may not come up for everyone. So, to not spoil it, let this review serve as a warning that if you get to a point where you really feel that you are stuck with no way to get out of your predicament, consider looking for the FAQ on BGG run by Paul Grogan. It’s pinned to the top of the Forum Section on the main T.I.M.E Stories page. There are plenty of questions and answers for all of the scenarios, protected by spoiler boxes… But, don’t go there now, because just reading the questions can still give you partial spoilers, and that’s taking all the fun out of the game. I will say that this scenario has the fewest clarifications of any of them so far, but getting stuck for 45 minutes really deflates my opinion of the game as it did sour the overall experience. But, let’s not dwell on that. We still had fun, taking just over three hours to solve this puzzle, and outside of the frustration of the misprint, this was the most engrossing story yet. I am actually quite excited to see the future scenarios to see if they build on the storytelling from this one. I do hope that the proofreading is a bit improved though as there has yet to be a T.I.M.E Stories scenario that didn’t need some sort of clarification… (Well, caveat here being that for some groups that didn’t get stuck here, this may have been a “perfect” scenario). Craig V: I am really fortunate to be part of a great game group and we definitely enjoy playing games like T.I.M.E Stories: Lumen Fidei. We have played all of the previous T.I.M.E Stories scenarios together as well as nearly twenty different escape room games. We love puzzles and the general play experience of T.I.M.E Stories is still pretty good, but there were several things about this particular scenario that really frustrated me. It’s difficult to say much more than that though without spoiling anything, so for now I’ll just state that it’s really still really just more of the same. Maybe that’s good for some and it’s encouraging that new content is still being developed for T.I.M.E Stories, but the system just doesn’t seem to be evolving as much as I had hoped other than spinning off the Unlock! series of games. 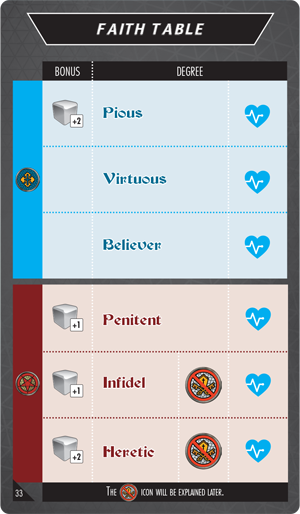 Lumen Fidei ranks as my fourth favorite of the six T.I.M.E Stories scenarios currently available.